Holly doesn't have it easy - not only did her boyfriend Rob recently die in a tragic accident, but she also becomes the caretaker of her grandfather after he's been diagnosed with Alzheimer's. Rob's friend Jason takes a romantic interest in Holly, and just as she starts to open her heart to him, she discovers that Rob's ghost has been communicating with her grandfather. Also noteworthy is Davis use of POV. Holly is written in first person, Rob in second and Jason in third. It's a pretty risky narrative choice, but I thought it worked really well. While this wasn't as romantic as Davis' THE CLEARING (which I adored), it's very open and honest about the realities of life and love. 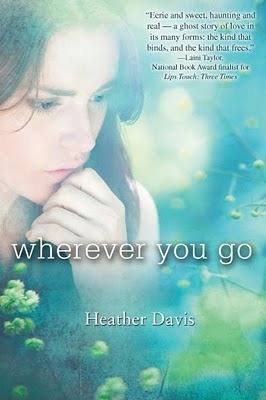 WHEREVER YOU GO came out this week. Find out more about it at the author's website. I enjoyed your review. Sounds like a great book, and I'm interested in all the pov styles. Though not very familiar with second person. It does sound like an interesting and unusual narrative choice. I would be interested to read it just for that reason, but the story sounds great as well. This sounds interesting! I'm intrigued by the way it's narrated, too. I def. have to check this one out! What an interesting premise for a book! The fact that Holly has to be an adult before her time, and the ghost story component really resonate for me and make me think that this would be something I could happily devour in a couple of hours. This was a very convincing and compelling review, Lenore, and I enjoyed it greatly. This book is going on my Christmas wish list right now! This sounds like it could be very good. I like the idea of the dead boyfriend communicating with the grandfather. I will definitely have to check this one out. Even with the ghost element, this does sound realistic and like the type of YA I enjoy. This sounds like an author worth checking out. Good review! I was looking for this book online when I stumbled at your blog. Its good to see a good review about this book and it makes me more excited to read it. Thankful! I have reading time this week!